As our jobs creep into every minute of daily life, it can be hard to get away. So don’t even bother. When you don’t want to use vacation days, work from the pool. Check out these hotels that combine work with play, taking life as a digital nomad way beyond the confines of your local coffee shop. 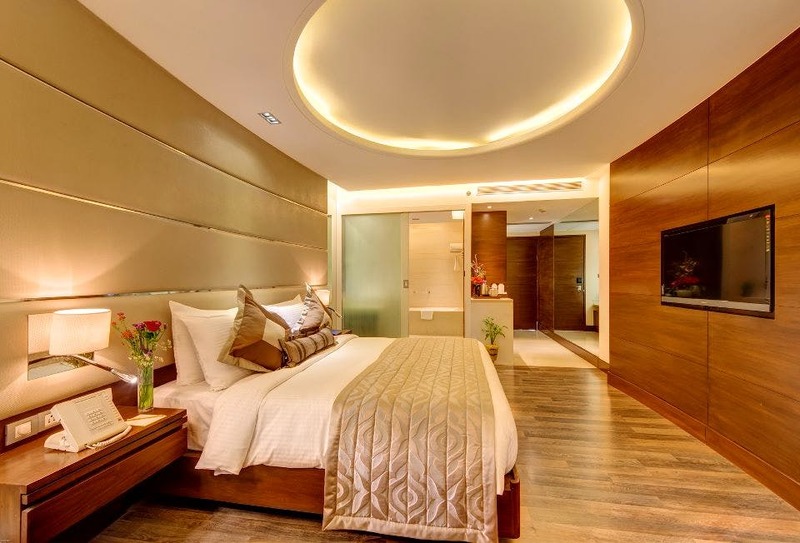 Because comfort is most desired when on work travel, HHI in Kolkata’s oldest CBD must definitely be in your radar. A luxury hotel with plush comforts, HHI has five different kinds of rooms for you to pick. With well-provided amenities and warm wooden interiors, the rooms are cosy and comfortable for a good stay. Best of all, if your ways are those of a workaholic’s, then you can pick to stay in rooms that come attached with a small office space. Work travels sometimes also come leashed on a budget. When in Kolkata for work and if you’re looking for a place near the airport then Holiday Inn is your best bet. A rooftop pool, well-equipped fitness centre, two restros in house and a lounge bar, this one’s offering luxe comfortable stays under a healthy budget of INR 6K. Just 5 km away from the airport, you’ll watch more metal birds zip across the sky, than real ones! The Kenilworth Hotel in central Kolkata offers sleek modern luxuries within a colonial architecture. Located right at the heart of the city near Park Street, when at Kenilworth, you’re never far from business houses, shops, restaurants and bars. With their luxurious spa, a holistic fitness centre and aromatic restaurants serving great food, you won’t have to go city exploring to find all the comforts that you need. Plus, they have the well-stocked English pub whose rich wooden interiors, lounge ambience and live music is perfect for after work relaxation. With a good number of single rooms and suits to offer, Senses is a good mix of business and leisure in Salt Lake. Apart from their fitness centre and several banquets to host conference and meetings, Senses is best known for their rooftop pool and of the poolside bar Liqua. Rajarahat’s Pride Plaza’s location makes it a favourite among most work travellers. With work located at Rajarhat’s business district, Pride Plaza’s central location makes every thing accessible. Spacious rooms, quick service, snazzy health club and two fine-dining restros — Pride Hotel is the middle class person’s affordable luxury stay. And with the airport close at hand, this one hould definitely be on your check list. Located in Salt Lake’s Sector V, AltAir occupies three floors of luxury in a modern upscale building (floors 19-21), and is perfect for a work stay if your office is in Salt Lake’s office para. While there are twenty-three Rajasthani styled rooms to put up in, there are amenities like a jacuzzi, an infinity pool, a sunbathing deck and a fitness studio to indulge in. Post work, of course, you can unwind in their rooftop that acts as a sky bar by day and a resto-bar by night. If you’re travelling on a tight budget then check into north Kolkata’s O2. Not an offshoot of any chain hotels, O2 is a city brand which will take care of your comfort and your pennies. Expect no plush décor or high aesthetic indoors because budget is the key word here. With forty-one rooms, a multicuisine restro and a mish-mash of a pub, this one will keep you comfortable till your flight out, all within a budget of INR 5K. The Park Prime Hotel offers splendid contemporary accommodation with a touch of the artistic. From the bold wedge shape of the facade to the sculptural feel of each informal space, the hotel elevates the senses. The four levels of rectilinear projections houses 63 rooms with trippy decor. Its central location on AJC Bose Road is a huge advantage, being close to the city centre and business districts and not too far from the Ma flyover which will zip you through to the airport. You can enjoy delectable food at their multicuisine restaurant, The Khana Sutra, or you spend time at Nosh, the 24-hour bistro or at the rooftop Henry’s Lounge & Bar. They also have a swimming pool o the roof and a spa which offers different kinds of massages, treatments, body scrubs and wraps.